Bovine TB is a chronic, highly infectious disease that is caused by a bacteria closely related to the bacteria that causes human TB. 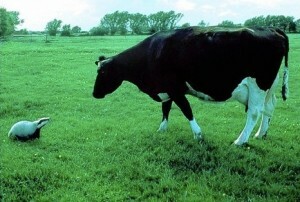 TB in humans has been generally controlled, in part by the pasteurisation of milk. The bovine disease is contagious and spread by contact with infected domestic and wild animals, usually by inhaling infected droplets which are expelled from the lungs by coughing. The disease often spreads when infected cattle are mixed with uninfected cattle, so movement of herds contributes to the spread of bovine TB. It is so contagious that farmers can lose entire herds of cattle. Other animals are infected by TB and can spread it amongst their own species and to cattle. In Ireland badgers can spread TB to cattle. While movement of cattle, and other farm practices, are significant contributors to the spread of bovine TB, some farming communities, and some government agencies, focus on destroying populations of badgers as a solution. Many studies and environmental groups have questioned the accuracy of claims that culling, or killing, badgers has a significant effect on bovine TB in cattle herds. In some places the emphasis has been on developing and using existing vaccines to control bovine TB rather than destroying badgers. Are there currently available vaccines for cows and badgers to protect against bovine TB? If so, are they being used by the governments on the island of Ireland? If so, are they effective? If there are vaccines available, and they are not being used, why not? See Interview with Pádraic Fogarty, Irish Wildlife Trust, on badger culling, and other matters, in the Podcast section of the current issue of irish environment magazine.